Track down Solus, an evil criminal mastermind who has eluded even the great White Knights of Falador! A dangerous, exiled criminal called Solus has returned once more to threaten the civilised lands of RuneScape. The White Knights responsible for dealing with this threat don't seem capable of meeting the challenge... perhaps some adventurer can succeed where they have failed? Use all of your tracking skills, and a little Temple Knight technology, to track him down and bring this criminal to justice once and for all! Firstly, speak with Sir Tiffy Cashien in Falador Park. Ask if he has any jobs for you, and he lets you know that a clerk has made an error and that you're not actually permitted to join the Temple Knights if you're not in the order of the White Knights. It turns out you have to work as a squire for 5 years... Or take Tiffy's alternative. He'll talk for a little longer about a loophole, then he'll ask you to go see Sir Amik Varze in the Falador Castle. Find Amik and he'll ask you to become a squire after a small conversation. Decline his offer, and the conversation will continue. It turns out that there needs to be a crisis for you to become a knight, so go report back to Tiffy. You'll have to talk to him then go back to Amik, you "old bean." But it turns out that you are "a human bean... I mean being!" Head on back to good ol' Varze, that old bean. He tells you the news that some bad guy named Solus is back, the "infamous murder-mage." Follow the very unclear conversation through to the end and accept his mission. Now for the age-old last resort, back to Tiffy, that old bean. It turns out you're just the "agent." Now you'll have to make an item for him, or you could just buy it. You can hand over a law rune, a slayer gem, and a molten glass and Tiffy will make it for you, or you can just pay him 10k. Either way, you'll get a Commorb. Scan - once in range, you can scan for Solus to find him. Contact - allows you to contact Savant. Use - just your normal, everyday "use" option. Playback - will give you your current and past assignments. If you choose contact, you can talk to Savant. It turns out you should investigate the Taverley Dungeon and you should also take a look at the Zamorak Mage that helps in Runecrafting. For our first stop, let's head over to the Taverley Dungeon. Go south past the Animated Axes, past the Hill Giants, and into the Black Knight's rooms. In the southwestern-most room is Lord Daquarius. Savant advises you not to try to bluff him into giving you something. Go kill a level 44 Black Knight and he'll give in. He tells you that Solus is in a place with a lot of fur that is not bear fur. If you haven't yet begun the Zamorak Mage mini-quest, you can find the Zamorak Mage at the mouth of the river north of Edgeville. 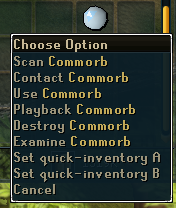 You must speak to him and begin the Zamorak Mage mini-quest first, after which time he will move his location to Varrock. The Zamorak Mage in Varrock (near the Chaos Altar in the southeast corner of the city) tries to take your Orb, but Savant doesn't let him. He offers to trade his information for 20 Rune or Pure Essence. Dash up to the bank and grab them. Your character very smartly figures out he's in Canifis. Grab your Ectophials, folks, and away we go! Warning: After finding Solus for the third or fourth time, he will cast Flames of Zamorak on you which will reduce your lifepoints by a significant amount (up to 95%). However, you will be protected enough from Savant to not be killed. Therefore, avoid wearing a ring of life during this as it may teleport you away unnecessarily. Bone Spear Dorgeshuun Mines - you'll find a woman but it turns out to be Solus. Fake Beard Ali Morrisane's stall in Al Kharid. Rune Essence Rune Essence mining cavern. Toy Horsey Draynor Village, near Diango. Unholy Symbol Scorpius' Grave, north of the Observatory. Wizard Hat The Wizards' Tower located south of Draynor Village. Red Vine Worm McGrubbor's Wood. Warning: The last place you find Solus at, you will also be confronted by a level 34 Black Knight. Additionally, be sure to pick up any pets or familiars before entering the Rune Essence mine; otherwise your pet will attack you! Eventually you should get some Rune Essence, so head off to whichever Rune Essence teleport spot you want. Scan in there, and Savant will close off possible teleports, to trap him. After a small cutscene, she'll summon some rangers to attack, but he kills them all. Go attack him yourself and you should notice the super powerful mage has turned into an easy melee monster weak to water spells. Kill him (you can use the rocks as a safespot if necessary) and you'll get his hat. In order to increase your ranking, you must kill a certain number of Black Knights. You start off as a Novice at 0 kills, and as you kill more knights, you'll grow in your rank. For the novice level, you do not need any kills. You are able to buy a White Knight Chain for 1,440gp and White Knight platelegs for 1,920gp. For the peon level, you must have a least 100 black knight kills. Once you achieve this, a message will appear in your chat saying that you have become a White Knight Peon. 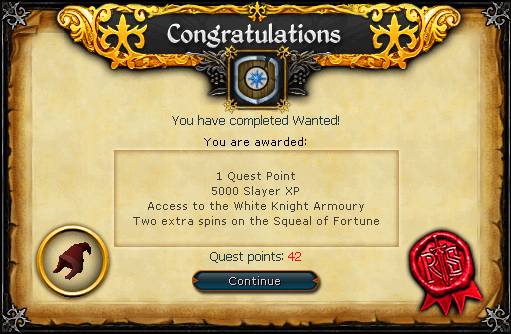 Once you achieve this level, you can buy White Knight sword for 624gp and a White Knight dagger for 240gp. For the page level, you need to kill 200 black knights. Also, you will see a message in your chat box which will congratulate you that you have reached the White Knight Page rank. At this level you can also buy a White Knight skirt for 1,920gp, a White Knight medium helm for 576gp and also a White Knight square shield for 1,152gp. For the noble White Knight rank, you need to kill 400 black knights and you will also receive a message saying that you have reached the noble rank. Once you have reached this rank, you can buy a White Knight mace for 432gp, a White Knight magic staff for 200gp and also a White Knight longsword for 960gp in addition to the other equipment. Finally the much sought after White Knight Adept rank, but you still have one more to go. You need to kill 800 black knights and a message will tell that you advanced to this level. Once you become an Adept White Knight, you can buy a White knight platebody for 3840gp, a White Knight full helm for 1056gp, a White Knight kiteshield for 1,632gp, a pair of White knight boots for 576gp, and a pair of White Knight gloves for 6gp. Congratulations, you have reached the Master White level, although you need to kill 1,600 overall black knights. This will take you a long time to achieve, but the rewards are great if you succeed. You will be rewarded with various White Knight weapons which includes, a White Knight warhammer for 980gp, a White Knight battleaxe, a White Knight scimitar for 768gp, a pair of White Knight claws for 360gp, a White Knight 2-Handed sword and a White Knight halberd each for 1,920gp. Tip: A great place to increase your ranking with the White Knights is in the Taverley Dungeon. Past the Animated Axes and Hill Giants is an area where you'll find lots of Black Knights to train on. With the completion of this quest, you'll have access to an entirely new type of armor: White Armor!